Montalcino and Montepulciano are two engaging hill towns in southern Tuscany (i.e., Tuscany south of Siena) with distinguished pasts and embellished with historic architecture and Renaissance art. Both Montalcino and Montepulciano are also well known for their wines and both cities and their environs are filled with cantine, enoteche (wine bars) and world-famous vineyards. Montepulciano’s most well-known wine is Vino Nobile di Montepulciano while Brunello is Montalcino’s, and arguably Italy’s, most distinguished wine. The Tuscan countryside is beautiful and visiting local wineries can be interesting and informative as well as a lot of fun. However, touring and sampling wines at local wineries is different than touring wineries in the U.S. There are some big wine estates in southern Tuscany, such as Banfi near Montalcino and Avignonesi near Montepulciano. These and other larger Tuscan wineries are generally open every weekday for the better part of the day, have fully-staffed tasting rooms and vineyard tour guides proficient in a number of languages. A wine tasting may be free but typically there is a small charge for the wines tasted that depends on the number and variety of wines tasted. As in the U.S., visitors are welcome at these larger wineries without appointments. Vineyard tours, however, usually require advance reservations. But, there are always exceptions so it’s best to check wineries’ websites for details prior to visiting. In contrast, the majority of Tuscan wineries are medium to small-scale producers. These family-owned and operated enterprises are usually not staffed to handle casual, drop-in visitors. Consequently, it’s appropriate to make reservations for a tasting and/or tour at most wineries in Tuscany or elsewhere in Italy, usually with a minimum 2 -3 days advance notice. It would be risking disappointment to just drop in for a wine tasting and/or tour without an appointment, especially in the fall when winery staff are extremely busy with the harvest and cellaring. Making an appointment also has the advantage that the winery may be able to arrange an English-speaking person to host the tasting and tour. With appointment in hand, someone active in and knowledgeable about the winery’s operations will typically host you, oftentimes a member of the winemaker’s family. I have without exception found winery hosts in Tuscany and elsewhere in Italy to be exceptionally hospitable and pleased to show you their winery’s operations and products. As with the larger wineries, the wine tastings may be free or there may be a small fee for tasting wines. Regardless, it would be impolite to not purchase at least a few bottles of the estate’s wines. However, because of the difficulty of bringing wines home on an airline, I have to limit myself to a few wines that I can fit comfortably and safely in my luggage. When I do so, I typically try to purchase wines not generally available in the U.S. on the assumption that this gives me bragging rights when I finally serve these wines to guests at home. It is also worth mentioning that Tuscany is famous for its twisting country roads and paucity of helpful road signs. While one can do worse than get lost on a Tuscan country road on a summer day, it can be frustrating if you’re trying to keep to a schedule. Also, unlike the U.S., there typically are no helpful signs at the side of the road pointing the way to a winery. So, before starting out on your adventure in the Tuscan countryside, be sure to take along a dependable and detailed road map (the Touring Club Italiano regional map of Tuscana is highly recommendd) with explicit directions on how to get to the winery. Usually directions can be downloaded from the winery’s website. Even better, make sure that your rental car is equipped with a GPS. There are dozens of wineries in southern Tuscany. The wineries listed below are but a small sample of wineries - arranged in no particular order by city - that welcome visitors for tours and tastings. Most produce and market a number of local red and a few white wines as well as some specialty wines and spirits like Vin Santo and Grappa. Phone numbers and websites with email addresses of individual wineries are included to facilitate making reservations. 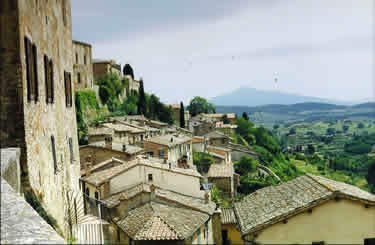 Montepulciano is a storied Renaissance hill town, famous for its beautiful palaces and medieval wine cellars. The city was an ancient Etruscan settlement that became a center of artistic and cultural life during the Renaissance. Its main street, Via di Gracciano – otherwise known as the Corso - is a lively, vibrant street lined with small shops, markets and cafes, with a genteel, small town vibe. The Corso winds its way up in a corkscrew fashion, with little alleys branching off at unexpected angles, for the better part of a mile to Piazza Grande, Montepulciano’s major piazza and the highest point in the city. From here, there is a sweeping view of the surrounding countryside from the city walls. The main sights in Montepulciano include Piazza Grande; Palazzo Comunale, designed by Michelozzo; the Temple of San Biagio, designed by Antonio da Sangallo the elder and which may well be the Italy’s most renowned Renaissance temple; the Civic Museum; and the Crociani gallery, which contains numerous paintings from the 14th - 19th centuries. Montepulciano is also the home of the celebrated Vino Nobile di Montepulciano wine. This wine has a proud history dating back for centuries. The wine received the “noble” designation in the 17th century because it was reputedly the favorite wine of area noblemen. This wine was also among Thomas Jefferson’s many favorites and was also served by Martin Van Buren during his term in the White House. In more recent times, it was among the earliest wines to receive the coveted DOCG status in 1980. Vino Nobile is made with Prugnolo Gentile, a local clone of Sangiovese. However, regulations permit the addition of up to 20 percent of selected other local red varieties. Vino Nobile must be aged for at least two years in oak (or three years for a riserva designation) before being released for sale. While Vino Nobile is Montepulciano’s most celebrated wine, other wines of note include Rosso di Montepulciano, which comes from the same production zone and grape variety as Vino Nobile but offers a more accessible and less expensive version of the more famous wine (see, for example, Poliziano). A local version of Chianti - Chianti Colli Senesi - is also produced here as is Valdichiana, a refreshing white wine. Vin Santo, an excellent sweet dessert wine, is also produced here as are some commendable Super-Tuscan wines. This estate has always been the centerpieces of the Montepulciano wine scene. Here you can taste wines, go on an extensive wine tour of the Avignonesi estate and have a meal at the winery’s restaurant. Their premium wine is actually a sweet dessert wine, Vin Santo di Pernice. This award-winning wine is outrageously expensive - but worth every euro! Open for visits and tastings by appointment only Monday - Friday, 8:30 am – 12:30 pm and 2:30 – 8:00 pm. Open for visits and tastings by appointment only Monday - Friday, 3:00 - 8:00 pm and on weekends by request only. This environmentally-sensitive producer has an on-site enoteca for wine tastings and a B&B to accommodate overnight or long-stay visitors. This is probably the largest wine shop in Montepulciano and boasts hundreds of labels from virtually all wineries in the area. It also offfers light snacks as a meal or to complement a wine tasting. Offers platters of cured meats and cheeses as well as some simple pasta, salad and other dishes to go with a glass or bottle of wine from their extensive wine list. They have occasional live jazz concerts. They have a small terrace that offers an awe-inspriring view of the countryside, especially at sunset. This restaurant is near the Tempio di San Biagio, just outside the city's ancient walls. This highly-regarded restaurant serves traditional Tuscan cuisine with a light touch. This fine restaurant is located in the hamlet of Lucignano, about 18 miles or a half-hour drive due north of Montepulciano. The drive is scenic and the destination well worth the effort. The small town is one of Tuscany's hidden gems so arrive early and tour the town. The restaurant is built on the city walls of this ancient city. Upon entering, the restaurant appears smaller than it actually is because it is partitioned into several different dining areas. Our party of six was comfortably seated in our own tastefully-decorated dining area. The menu features traditional dishes of the local area with a modern spin but nothing too fancy or too fussy. Service is excellent and friendly but not intrusive. The cuisine, an excellent and deep wine list and delicious desserts all add up to a great dining experience. Weather permitting, opt for a table on the restaurant's much-sought-after veranda with its great view of the surrounding countryside. Reservations recommended. Ristorante Oreade is ensconced on a steep hillside in the remote hamlet of Castiglioncello del Trinoro, about 8 miles south of Montepulciano. It is accessible only after an upward slog on a narrow and winding gravel road which can be daunting without a pre-loaded Google map since there is no cellular reception. It's location gives new meaning to the term "destination restaurant." But don't let its remote location deter you - the view from the restaurant is spectacular and the restaurant itself is one of the area's finest so the drive is well worth the effort. The restaurant is part of an upmarket resort that includes some classy villas and a boutique hotel. Located in a beautifully renovated 17th century building, Ristorante Oreade is brimming with charm and atmosphere. The service, the wine list and Tuscan cuisine are excellent and worth every euro. Reservations required. This restaurant is located a short distance southwest of Montepulciano in the medieval village of Monticchiello. It has a wide selection of regional dishes and wines and the view of the surrounding countryside from the terrace is a real plus. Your dinner, the excellent service as well as the view may encourage you to rent one of their artfully-furnished apartments for all or part of your stay. Located on a quiet side street you have to look carefully or you'll miss it. Traditional Tuscan food with some modern touches with personal, friendly service. This low-key, family-run restaurant has a good selection of seafood dishes as well as lamb, pork and beef entrees. But the fixed-price offering is always worth consideration. Friendly, attentive service and a praise-worthy wine list of local Montepulciano wines makes for a pleasant dining experience. The restaurant always seems crowded so reservations are necessary. When possible, try to be seated at a table on the much-coveted outdoor patio. This is a busy, no-frills and sometimes noisy restaurant that nonethless offers a warm and convivial dining experience. The specialty of the house is oversize servings of Fiorentina steaks that can challenge even the heartiest diner. But excellent pasta and other traditional dishes are also on the menu. The seating is family-style so you are sure to make plenty of new friends by evening's end. It is an entertaining but quality dining experience at very reasonable prices. This restaurant is very popular so reservations are mandatory. Closed Tuesday. This combination hotel, enoteca and restaurant is located just a few steps from Piazza Grande. The restaurant features some interesting and delicious beef, lamb and rabbit dishes and an extensive wine list. You can dine inside or on the small terrace. If the weather is pleasant opt for the terrace with its stunning view of the Valdichiana countryside and especially at dusk as the sun sets behind the distant mountains. The enoteca has an extensive offering of Tuscan wines by the glass at very reasonable prices. Reservations recommended. This is another delightful restaurant located in the tiny village of Monticchiello, a short distance southwest of Montepulciano. This indoor restaurant is tucked away in the sturdy walls of this medieval city. It is a family-run restaurant with a small but well-thought menu of Tuscan and French-inspired dishes. All the pastas are home-made and the desserts are outstanding. They also have a small shop "La Bottega" that sells local wines, meats, cheeses and jams. The Montepulciano office of the Strada del Vino Nobile di Montepulciano (the Vino Nobile wine road) will help book winery visits. The office is located on Montepulciano’s Piazza Grande and is open every day during the summer. For additional information on Vino Nobile wines, see the website of the Consorzio del Vino Nobile di Montepulciano. Pienza, a short distance from Montepulciano on the way to Montalcino, is well worth a visit. Pope Pius II, a true Renaissance humanist, was born here and when he became Pope he rebuilt the entire town as an ideal Renaissance town. Because of its historic role in urban planning and renowned architecture, UNESCO has declared the town a World Heritage Site. The Piccolomini Gardens of Palazzo Piccolomini in Pienza is one of Tuscany's gems. Commissioned by Pope Pius II the gardens are beautifully sited with a view of the valley below. Guided tours of the Palazzo are available and both the Palazzo and its gardens are well worth a visit. There are beautiful views of the surrounding countryside from the city's ancient walls. 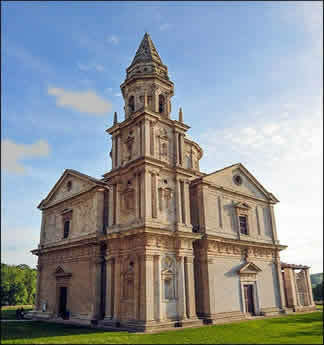 The Temple of San Biagio was designed by Antonio da Sangallo the elder in the early 1500's and is one of the architectural masterpieces of the Renaissance. While small in comparison to other more imposing structures from that period, the grace and symmetry of the Temple's architecture and the tranquility of its setting are truly awe-inspiring. It is conveniently located just a short distance outside Montepulciano's walls so you can either walk or drive to the Temple. Ample free parking is available. Cortona, one of the oldest hill towns in Tuscany, lies about 25 miles northeast of Montepulciano. Frances Mayes turned this town into a tourist destination in the 1990’s with the publication of her best-selling Under the Tuscan Sun. But don't let that deter you. While crowded with tourists, Cortona's medieval streets are dotted with charming sidewalk cafes, the narrow streets are pleasant to wander and there are fabulous views of the countryside from the town's ancient walls. Montalcino lies about 12 miles west of Montepulciano. It‘s a small medieval town balanced on top of a gently-sloping hill carpeted with vineyards and olive groves. It’s a quiet and unassuming town that has its own charms, not the least of which are numerous wine bars and restaurants that feature locally-produced Brunello di Montalcino wines, generally recognized as one of Italy's grandest wines. Montalcino is compact enough within the city walls that you can walk from one end to the other in half an hour or so. But doing that would be to miss the fun of getting lost in the winding streets and alleys and discovering medieval houses with gardens and orchards or unassuming churches with Baroque altarpieces and small museums with late medieval Sienese paintings. 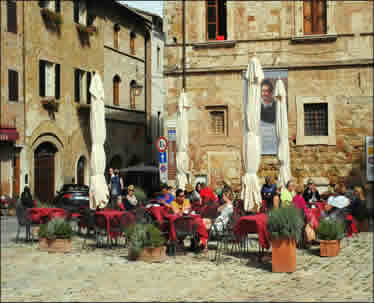 Piazza del Popolo is Montalcino’s main square, a small but very pleasant piazza lined with shops, cafes, bars and restaurants. Palazzo Communale with its slender tower fronts the Piazza and the tourist information office is also on the Piazza. A few steps further brings you to Piazza Garibaldi. The 14th-century Church of Sant'Egidio is at the far end of the piazza and Sant'Agostino, a simple church with some interesting frescoes is just off the Piazza. From here, its a short but uphill climb along Via Spagni to the Cathedral of San Salvatore, the highest point in the city. Backtracking slightly on Via Ricasoli will take you directly to the entrance of the monumental Rocca, or fortress, an impressive example of early 14th-century military architecture. This stronghold kept the Florentines at bay for years. It's fun to explore the rooms of the ancient fortress and the ramparts of the Rocca afford beautiful views of the city and Montalcino’s rolling countryside. The ground floor of the Rocca houses the Enoteca la Fortezza, a wine bar and wine shop with an impressive collection of Brunello and other lo cal wines available for tasting and/or sale. At this point your feet may well be aching from what seems to be a continuous up-hill climb and you will probably find yourself in need of some liquid sustenance. So it’s time to get down to business and sample some of the local wines which, truth be told, are really Montalcino’s major attraction. Montalcino’s most notable wine is Brunello di Montalcino, a dark, elegant red wine that holds the high ground among Italy’s finest wines. Well known for their longevity, Brunello wines are also famously expensive. Brunello is made entirely of Sangiovese (“Brunello” is the local dialect for Sangiovese). Brunello wines must age for at least 4 years before release for sale, of which a minimum of 2 years must be in oak casks or barrels. To qualify for riserva status, the wine must age for at least 5 years before release, of which a minimum of 2 years has to be spent in oak casks or barrels. Some producers age their wines in wood for longer periods than the minimum 2 years in order to achieve more elegant and austere wines. Fortunately, Montalcino is graced with numerous wine bars and wine shops that provide ample opportunities for tasting and buying local wines. Numerous wineries are also located within a short drive of Montalcino and provide alternative venues for tasting wines. 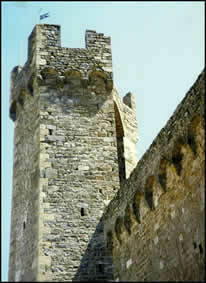 The Banfi winery is housed in an imposing medieval castle a short distance southwest of Montalcino. It is one of the largest wineries in southern Tuscany and markets an extensive line-up of Tuscan wines. It has guided visits of the winery Monday through Friday and offers a full range of wine tasting options at the estate's enoteca. The estate's on-site restaurant, La Taverna, offers an extensive menu of traditional Tuscan dishes. During the summer, seating is available in the evening on La Taverna's terrace alongside the castle's ramparts. Reservations are encouraged. They are open for wine tastings 7 days a week all year long from 10 am to 6 pm. There is a small charge for tasting that varies with the number and types of wines tasted. Wine tours followed by wine tasting are available weekdays only. The wine shop and tasting room is open 7 days a week but closes from 1:00 to 2:30 pm. This wine shop and wine bar is located in the cellar of Montalcino’s historic fortress. Guided wine tastings with anywhere from 2 to 5 wines, including Brunello, Rosso and Super Tuscans, are available. A wide variety of wines is available, many of which are served by the glass. Platters of cheeses and cold cuts are available as well as outdoor seating. This restaurant is just outside Montalcino on the main road from Siena and has a patio with a magnificent view of the Montalcino countryside. Piazzale Fortezza, 6 - Montalcino. This boutique hotel with its enoteca and restaurant are located just a few steps from the Fortezza. The enoteca has an extensive and well-curated wine list while the restaurant serves traditional Tuscan cuisine elevated by some interesting spice flavors. This restaurant and wine shop has a little patio with a great view of the surrounding countryside that is perfect for summer dining. It also has a fine wine bar for tasting wines. A remarkable restaurant with a sharp focus on quality wines and hardy Tuscan cuisine. The inside of the Trattoria is very simple but the food and wine list are excellent. Traditional Tuscan cuisine prepared by the owners in a comfortable, family-style setting. This popular family restaurant is located in Montalcino’s historic district and serves typical dishes of the Tuscan countryside. Located at the Fattoria dei Barbi winery, the restaurant has a patio with a great view of the estate’s vineyards. 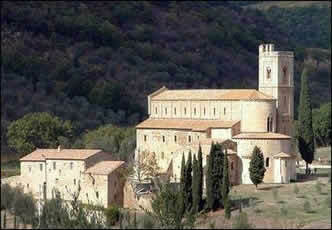 The Abbey of Sant’Antimo is just a few miles south of Montalcino in the direction of Castelnuovo dell’Abate. This magnificent medieval abbey was reputedly founded by Charlemagne and is still in use by a community of Benedictine monks famous for their Gregorian chants. (See their Website for visits and schedule of chants). The small town of Buonconvento is just a few miles north of Montalcino. This intact medieval town is completely surrounded by its still-sturdy 14th-century walls. From Buonconvento, follow the signs to the maj estic Abbey of Monte Oliveto Maggiore. Founded in the early 14th century, this large and still active Benedictine monastery has frescoes that are among Tuscany’s most important Renaissance artworks. See their Website for more information about the Abbey and scheduling visits. Costa del Municipio, 1 - 53024 Montalcino. The Tourist Office can assist with scheduling visits to local wineries. Open 10 am -1 pm and 2-5:30 pm April – October. Closed Monday. Consider making a contribution to further the work of WineWordsWisdom.com. PayPal account to make a contribution as PayPal will also process credit card transations.